Amid the breakdown of peace talks between Israeli and Palestinian negotiators, the public is divided over whether a way can be found for a peaceful two-state solution in the Middle East. Overall, 46% say an independent Palestinian state can coexist peacefully with Israel, 44% do not think this can happen. A year ago, 50% thought it was possible for an independent Palestinian state to exist peacefully alongside Israel, 41% did not. The new national survey by the Pew Research Center, conducted April 23-27 among 1,501 adults, finds that Republicans are particularly skeptical about the prospects for a peaceful two-state solution: just 34% think a way can be found for this to happen. Independents (50%) and Democrats (52%) are more optimistic that a solution can be found. A landmark 2013 Pew Research survey of Jewish Americans found 61% of U.S. Jews expressing optimism about the possibility of a peaceful two-state solution. A Pew Global Attitudes Project survey, conducted last spring, found that 50% of Israelis and just 14% of Palestinians believed that a peaceful two-state solution was possible. That report found optimism for a two-state solution was highest in France (71%) and lowest in Lebanon (11%) and the Palestinian territories, among the 13 countries surveyed. The current survey finds that in the dispute between Israel and the Palestinians, the U.S. public’s sympathies continue to lie much more with Israel. Roughly half (53%) say they sympathize more with Israel, 11% sympathize more with the Palestinians, and 16% volunteer that they sympathize with neither side. Support for Israel in its dispute with the Palestinians has been consistent over the nearly four-decade history of this measure. There continue to be partisan differences in views: 68% of Republicans sympathize more with Israel compared with 46% of Democrats (just 15% of Democrats and 7% of Republicans sympathize more with the Palestinians). The survey was completed before controversy arose over Secretary of State John Kerry’s comment at a closed-door meeting last week that Israel risked becoming an “apartheid state.” Kerry subsequently apologized for the statement, which he made during a private meeting of the Trilateral Commission and was first reported by the Daily Beast. The survey finds little change in views of Barack Obama’s handling of the Middle East conflict. A 45% plurality says Obama is striking about the right balance, while 22% say he favors the Palestinians too much and just 9% say he favors Israel too much. Overall, 34% of Republicans think a way can be found for an independent Palestinian state to coexist with Israel, while 56% do not think this is possible. Democrats think a two-state solution can be achieved by a 52%-39% margin. Liberal Democrats (59%) are more likely than the party’s conservatives and moderates (47%) to say an independent Palestinian state can coexist peacefully alongside Israel. Blacks express much more optimism about the prospects for a two-state solution than do whites and Hispanics. By about two-to-one (62%-29%) blacks say a way can be found for peaceful coexistence. Among Hispanics, 49% think an independent Palestinian state can exist alongside Israel, 37% do not think this can happen. Whites are about evenly divided (43% think a two-state solution is possible, 47% do not). Among religious groups, a majority of white mainline Protestants (58%) and about half of white evangelicals (52%) do not believe a way can be found for a way for Israel and an independent Palestinian state to peacefully coexist. Catholics are divided (45% think a two-state solution is possible, 41% do not) while the religiously unaffiliated, by 51% to 42%, think a way can be found for the two sides to coexist. Black Protestants say a two-state solution this is possible by a 64%-26% margin. In the ongoing dispute between Israel and the Palestinians, a 53% majority sympathizes more with Israel, while far fewer (11%) sympathize more with the Palestinians; 16% volunteer that they sympathize with neither side. 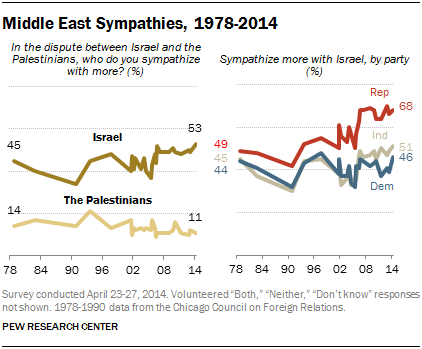 In polling by Pew Research and the Chicago Council on Foreign Relations dating back to 1978, sympathy toward Israel has never been higher. A decade ago, four-in-ten (40%) sympathized more with Israel and 13% sympathized more with the Palestinians. By the summer of 2006, sympathy with Israel had risen to 48% and has remained at or around 50% since that . Republicans continue to register very high measures of sympathy for Israel (68%), while 7% sympathize more with the Palestinians and 9% volunteer “neither.” Among Democrats, 46% sympathize more with Israel, 15% say they sympathize more with the Palestinians, and 15% say neither. The opinion gap is especially large between the two party’s ideological wings: 75% of conservative Republicans sympathize more with Israel, compared with 41% of liberal Democrats. As in past surveys, there are religious differences regarding sympathies toward Israel and the Palestinians. About eight-in-ten white evangelical Protestants (81%) sympathize more with Israel, up from 70% three years ago; just 4% today sympathize more with the Palestinians. White mainline Protestants (49%-11%) and black Protestants (44%-12%) sympathize more with Israel by less one-sided margins. Among adults not affiliated with a religion, twice as many sympathize more with Israel (41%) than the Palestinians (20%). Overall, 45% say that Obama is striking the right balance in the Middle East these days, while 22% say he is favoring the Palestinians too much and 9% say he is favoring Israel too much; about a quarter (24%) do not offer a rating. Views of Obama’s handling of the situation differ markedly by partisanship and religious affiliation. About two-thirds (65%) of Democrats say Obama is striking the right balance in the Middle East, with few saying he is favoring Israel (10%) or the Palestinians (5%) too much. By contrast, 40% of Republicans say Obama is favoring the Palestinians too much, while a quarter (25%) say he is striking the right balance and just 8% think he is overly favoring Israel. Among Republicans and Republican leaners who agree with the Tea Party, fully 65% say Obama is favoring the Palestinians too much, just 11% say he is striking the right balance, and 3% say he is favoring Israel too much. Republicans who do not agree with the Tea Party are much more divided in their views (34% right balance, 30% favoring Palestinians too much, 10% favoring Israel too much). Among all Protestants, 43% say Obama is striking the right balance while 28% say he is favoring the Palestinians and 6% say he is favoring Israel. White evangelical Protestants are critical of Obama: 43% say he is favoring the Palestinians compared with 31% who say he is striking the right balance. 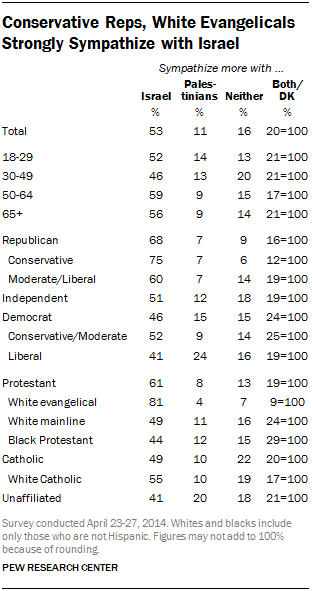 By contrast, nearly seven-in-ten (68%) black Protestants say Obama is striking the right balance; very few say he is favoring Israel (7%) or the Palestinians (4%) too much.